Libby on the Label: #52 Ancestors Week 2 - "Favourite Photo"
#52 Ancestors Week 2 - "Favourite Photo"
The prompt for Week 2 of the 52 Ancestors challenge is "favorite photo". A picture says a thousand words all right! That is my grandmother Jean Treleaven Marr Park Hadley with the full beard👳 I can't remember the name of her friend on the left, but they were good buddies. This picture was taken at Rondeau Park located in southwestern Ontario, Canada. It is the 2nd oldest Provincial Park in Canada. 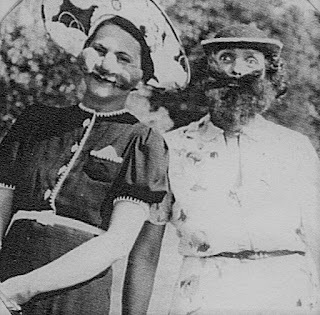 I don't know the exact date, but I will guess circa 1923. That was was the year she and my grandfather married. They were kind of party people, according to her. Bathtub gin and the whole Roaring 20s lifestyle. She would eventually quit drinking completely and became a teetotaler "I haven't had a drink in over twenty years", she would say, "but my daily average is still good!" 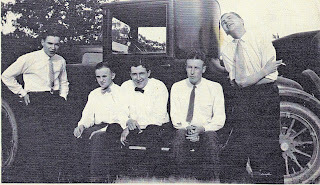 That's my grandfather, Archibald Beverly Park II, with his crew. 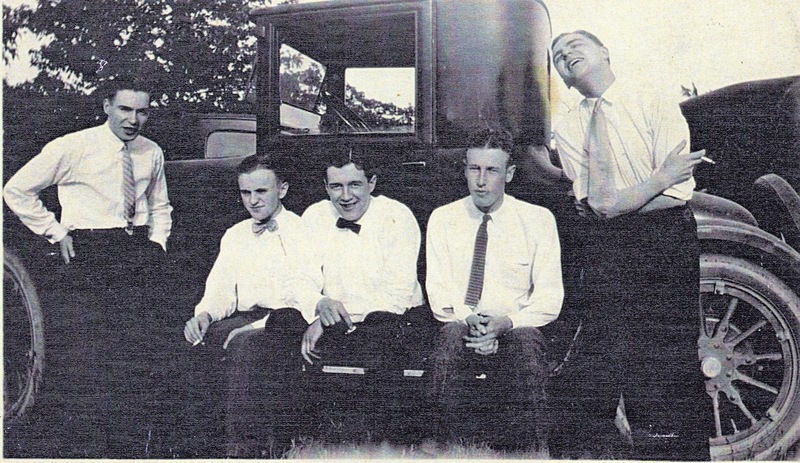 Bev, his nickname, is the 4th man from the left, next to the fellow who is laughing. This is another one of my faves, with the Model T in the background. From what my Grandma Jean said the two of them spent a lot of time at Rondeau Park in the summers. It was one of the meeting places for their friends to get together and socialize. Jean lived to be 92 years old and was sharp as a tack until she drew her last breath. During the last five years of her life, all of her children and grandchildren went to Vancouver to have one last visit with her. It wasn't maudlin at all. My older sister and I did our pilgrimage together. We spent time reminiscing about her life, looking through her photos and laughing. I asked Grandma if she had any regrets. Was there anything she wanted to do but never did? In typical Jeannie fashion she said "Well, I've never took a bath with a man!" (She would often say things that would make your jaw drop). When I pressed her about it, she said she had never ridden in a limousine. My aunt Evie (her daughter) said that Grandma used to sit looking out the window at the cars going by and guess who was in the limos she saw passing. It was like a game. Evie called it "Limo Spotting". The next day my sister and I secretly rented the biggest limo we could find. She had no idea. We made a plan that Aunt Evie, my sister and I would pick her up at the assisted living facility where she lived to start our day, that's all she knew.The door man walked her up to the car, and she couldn't believe it. She just loved it. Success! "Where do you want to go Grandma?" Her reply? "I have to go pay my bill at the pharmacy." 😊 Not very highfalutin, but she always did have a very practical side. So off we went! She had dozens of scrapbooks and photo albums that she collected through the years. I made some photo copies that weekend which I have in storage. I'm glad that I did. I don't even know where the originals are. I never knew my biological grandfather. He died at age 45. I'm thankful to have the stories and a few frozen moments in time to imagine what he was like. Wonderful photographs. Your grandmother sounds like she was quite a character! :) Thanks for sharing this with us. Your grandmother does sound like quite a character! I loved hearing her stories! And the limo ride brought tears to my eyes. I'm so happy you did that for her! :) And, I love that she wanted to go the pharmacy. 🤣 She thought that was one of the things we were going to that day, and she wasn't changing her plans!